In November 2012, the FDA approved the drug-eluting stent Zilver PTX to reopen the superficial femoral artery (SFA) when it closes or becomes blocked as the result of peripheral artery disease (PAD). Clinicians hope the stent, made by Cook Medical, will prove to be a step forward in managing this often difficult-to-treat disease. Michael Dake, MD, who was part of the FDA clinical trial involving the Zilver stent, suspects the product could have a “profound impact” on patients for whom traditional endovascular therapies are unsuccessful. “I can think of a lot of patients who are going to benefit from this—absolutely,” adds Barry Katzen, MD, FACR, FACC, founder and medical director of Baptist Cardiac & Vascular Institute in Miami who also participated in the Zilver stent trial and another with LifeStent, a self-expanding nitinol stent manufactured by Bard Peripheral Vascular. When PAD occurs in the SFA, patients may experience leg pain that limits their ability to walk and can result in serious complications, including skin ulcers and gangrene. An aging population combined with the number of people who are obese and/or have diabetes have created a “perfect storm” responsible for the increase in PAD, says Rob Lyles, vice president and global leader of Cook Medical’s peripheral intervention unit. “Thus, physicians who treat PAD are seeing an enormous influx of patients. It’s a big issue, and it’s only going to get bigger,” he notes. Lyles says it’s particularly difficult to treat blockages in the SFA for two reasons: PAD causes the artery to close, plus the SFA is a dynamic vessel. “When the patient stands, sits, walks, it stretches, it bends, it twists,” he says. Treatment for PAD includes exercise, drug therapy, and interventions to open blockages. 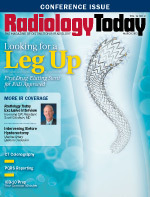 Over the last three decades, interventions moved from open surgery to minimally invasive techniques, including percutaneous transluminal angioplasty (or balloon angioplasty), and bare-metal stenting. About 25 years ago, balloon angioplasty emerged as the treatment of choice, Lyles says. However, balloon angioplasty works only about 30% of the time. “In 70% of patients, the artery is going to close up again, and the patient is going to continue to have the problems that they had before,” he explains. Though it was an off-label use, interventional radiologists began using biliary stents to treat PAD in the SFA about 15 years ago. The first on-label stent for these cases was approved about five years ago, Lyles says. But just like balloon angioplasty, the SFA can narrow and close again soon after stenting with bare metal, Lyles says. The addition of the drug paclitaxel to the flexible stent seems to make a significant difference. Cook Medical’s two-year trial of nearly 500 patients showed that those who received its paclitaxel-eluting stent did better than those who received either angioplasty alone or angioplasty and a bare-metal stent. After one year, 83% of the vessels treated with Zilver PTX were still clear compared with 33% of the vessels treated with angioplasty alone. Patients whose vessels became blocked after angioplasty were treated with either Zilver or a bare-metal stent. After one year, 90% of patients treated with the Zilver stent had not experienced another blockage compared with 73% with the bare-metal stent. ‘‘It has now been more than three years since the Zilver drug-eluting stent trial, and we’ve seen a 53% reduction in restenosis,” says Dake, a professor in the department of cardiothoracic surgery at Stanford University School of Medicine and the medical director of the cath/angio labs at Stanford Medical Center. The results “give people security and confidence that this is a durable solution,” he notes. Katzen says time has allayed concerns that Zilver’s long-term success may have been announced prematurely. “There’s something called ‘late thrombosis,’ where a year or two out, the arteries become blocked abruptly, and there was some concern that could happen with these stents. But that hasn’t proven to be the case,” he says. Zilver PTX is made of nitinol, a self-expanding metal alloy that springs back into its original shape when placed in the artery. Because it’s flexible, the metal can meander around the curves normally found in the iliac arteries, which carry blood from the abdominal aorta to the legs and feet. Self-expanding stents are needed in the SFA because they must torque and compress with the leg as it moves, Lyles notes. The stent’s outer surface is coated with paclitaxel, which is used in cancer chemotherapy. Unlike some earlier drug-eluting stents, Zilver PTX does not use a polymer coating to slow the release of the drug over time. When the drug is bound to a polymer, it can take 30 to 45 days to leach out. “With this stent, pretty much as soon as it hits the wall, 99% of the drug is eluted into the vessel walls,” Katzen says. Manufacturers had been looking for ways to eliminate polymers from the stent because it was thought the polymers were responsible for the restenosis seen in coronary arteries treated with other drug-eluting stents. Dake explains that the paclitaxel is delivered in crystalline form, so it lasts for five or six months. By that time, “The vessel is healed, and there’s no longer an impetus or driver that would cause it to close up again,” he says. The drug doesn’t need to be released slowly because it has a permanent effect on the cells it comes in contact with, he says. As a precaution, it is recommended that patients who are treated with the Zilver stent go on antiplatelet therapy for two to three months. Most of the patients (61%) in the trial for FDA approval already were on antiplatelet therapy, Dake notes. The Zilver PTX stent is available in the United States at 80-mm length and diameters of 6 and 7 mm. The FDA approval includes 40- and 60-mm lengths that will be introduced later this year, Lyles says. Cook Medical also hopes to receive FDA approval to market 120-mm lengths in both diameters in the United States later this year. The company is marketing the 80-mm length as a two-pack for use in treating legion lengths up to 140 mm until the longer lengths are available. Zilver PTX is available in 50 markets worldwide, including the European Union, Taiwan, Japan, Australia, New Zealand, and most of South America. “Ironically, this is the first device from the US approved in Japan before it was approved in the US,” Dake says. In the clinical trial, the longest lesion treated measured 14 cm, and the average lesion length was close to 7 cm. “That’s a short- to medium-sized segment to treat,” Dake says. In the randomized controlled trial, some stents were overlapped, “so we know for a fact there is not any untoward effect of having a double dose of drug in some areas—that wasn’t seen,” he notes. Longer lesions have a greater need for a stent like Zilver, Dake says. “We’ve known since the early days of angioplasty that the effects of endovascular treatment are correlated to the length of the lesions. A 1-cm lesion may do fine with plain old balloon angioplasty, but the longer the lesion, the more complex the lesion, and the more heterogeneous the lesion, the less likely you’ll have a durable effect from angioplasty alone,” he explains. Katzen says he still favors balloon angioplasty alone in patients whose SFA stenosis is less than 5 cm. “In patients over 5 cm, we have a stent-first strategy,” he says. Katzen believes that treatment should be individualized and that some patients still will benefit more from bare-metal stents. Dake expects that, within a decade, drug-eluting stents will replace bare-metal stents, and drug-eluting balloons will come to market and replace regular balloons. As a condition of FDA approval, Cook Medical must conduct a postmarket study, which is scheduled to begin shortly when the product is available and study enrollment sites have been selected.